How important is the design of game icons, the visual indicators of the titles available to launch from our consoles’ dashboards? A number of Switch owners are very particular about the colorful squares that show up on their home screens. They’re calling for changes, and developers are listening. On Thursday, September 18, three days before the launch of SteamWorld Dig 2, Swedish game developer Image & Form tweeted out an image of their new game installing on the Switch. It’s no surprise the original icon for SteamWorld Dig 2 caught such flack. For one, it’s pretty ugly. According to Image & Form CEO Brjann Sigurgeirsson, speaking to Kotaku about the icon kerfuffle, the icon was the result of accidentally including the Windows/Mac desktop icon file with the final build sent to Nintendo. But the Switch game icon critque has been going on for months. One of the earliest examples involves a downloadable game called Snake Pass, a unique slithering platformer from developer Sumo Digital. When Sumo Digital’s Snake Pass launched in March, it had a relatively standard icon, featuring some art from the game and a logo. It looks like many other game icons on the Switch, or any game console for that matter. Indeed, according to an image posted to Reddit last month, Nintendo guidelines suggest game icons feature both an image representing the game and a logo. On June 21st, the Snake Pass icon changed. The logo was removed, and the snake character’s head was made more prominent. Developer Sumo Digital told Kotaku the change was made in order to make the icon consistent with the one used on PlayStation 4, Xbox One and PC. It’s a common conceit among Switch game icon critics. An icon without a logo looks like something you’d find on iTunes or Google Play, where space is limited and logos are too small to read. Clash of Clans maker Supercell has had tremendous success with icons that are little more than angry faces, and other mobile developers have followed suit. One of the more divisive no-logo icons is Sonic Mania, with many Reddit threads discussing its pros and cons. 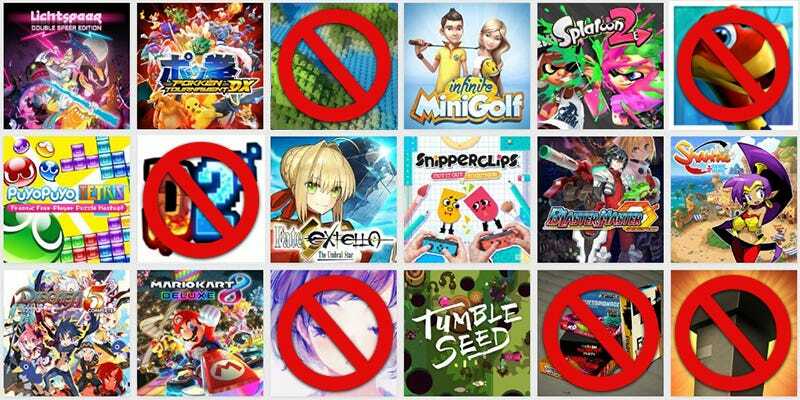 With each new “bad” game icon showing up on the Switch dashboard, the voices of dissent get louder, and developers seem surprised by the powerful reactions. The reaction from the team behind SteamWorld Dig 2 was a bit more animated. Furthering Image & Form’s frustration was the fact that the criticism began days before SteamWorld was to be released. “The game wasn’t even out yet when people started talking about it, so they couldn’t really say ‘bad icon, but hey, the game is great’; they were in fact limited to just ‘bad icon,” said Sigurgeirsson. The new icon will be coming soon in an update to SteamWorld Dig 2. Image & Form isn’t the first company to change its Switch icon based on community feedback. TT Games, the developer of Lego Worlds, caught a lot of flack from the community when its game first showed up on the Switch, and for very obvious reasons. It’s the second from the left in the screenshot below, and it looks like absolutely nothing. Lego Worlds was released for the Switch on September 5. The icon showed up on the Switch Reddit two days prior to launch. On launch day, a representative from TT Games posted a picture of a new and improved icon, which was recently added to the game in an update. It’s much better. Note the Lichtspeer icon also changed via an update between the first and second screenshot. While it fits the style of the game, many Switch owners also did not appreciate the minimalist icon design for the recently-released strategy adventure game Kingdom: New Lands. As for Snake Pass, the game that made rallying against ugly Switch icons a thing? Sumo Digital has good news.